Heads up! This deal ends today. Yep, this fantastic transfer bonus ends today. I’m debating shifting over 10k or 15k Amex just to have a few more Avios in the account should I want to fly to see my family last minute (LAX – IND is just 10k Avios), or if I’d need a few extra to do a nice upgrade on BA. It’s been quite a few months for the ole Avios program which, in July, went from a 4:5 Amex transfer ratio, to parity, to a great 7:5 limited time bonus ratio: that’s a whopping 75% increase in the amount of Avios you could score transferring from Amex. Tomorrow, the ratio goes back to 1:1, so if you have any upcoming trips and may need some Avios…this is your time. Personally I think that some of the best redemption options for Avios are positioning flights. Avios are also a great use intra-Asia where you can fly Cathay Pacific business class on many routes for just 15k Avios. Another great use of Avios is upgrading a flight – I’ll show you first class ( in the feature picture) but the concept is the same from cabin to cabin. BA releases a considerable amount of award space, and they often release quite a bit of first class space from the east coast to London. What’s the cost to utilize an upgrade? Just the difference in Avios between your cabin of service, and the cabin you’re upgrading to. Let’s take a look at a Business Class to First Class upgrade from JFK to London. In peak times it’s only 20k Avios to upgrade to First Class. 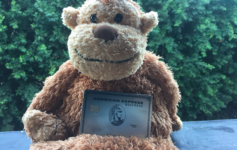 Because of the 40% Amex transfer bonus that number drops to just 15k Membership Rewards. Amazing deal. Next Article New American Airlines Flagship Lounge open at Chicago ORD – Do you have access tho? How’s $100k sound to travel and photograph a family for a year?